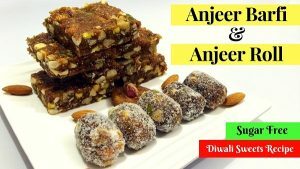 Today I am sharing an easy to make & quick Diwali Sweet Dish recipe – Rava Laddu / Suji Ke Ladoo. There are many methods for making Rava Laddu, I have added Desiccated Coconut & Besan along with Rava as the main ingredient. Coconut adds a pleasant aroma; you can also use freshly grated coconut instead of dried coconut. I have not used Mawa/Khoya, and for binding, I have used Ghee (Clarified Butter). Follow this step-by-step recipe for making Rava Laddu at home this Diwali. Don’t forget to share your feedback on this recipe. Heat 1 tbsp. Ghee in a pan over low flame. Sauté Cashews in Ghee until they turn golden brown, drain and transfer to a plate. Sauté Raisins until they puff up, drain and transfer on plate. Add 2 tbsp Ghee in the same pan. Add Rava, roast on low flame for about 5 – 7 minutes, stirring continuously. Switch off the gas and add Besan & Desiccated Coconut, sauté for 2 minutes. Add Powder Sugar, Milk Masala (Mix Dry Fruit Powder) and Cardamom Powder. Finally, add Cashew & Raisins. Add Ghee as required for binding laddus, stir again. Take a small portion in your palm and roll medium size Laddus while the mixture the mixture is still hot. Serve immediately or let them cool down completely and store in air-tight container, consume within two weeks. 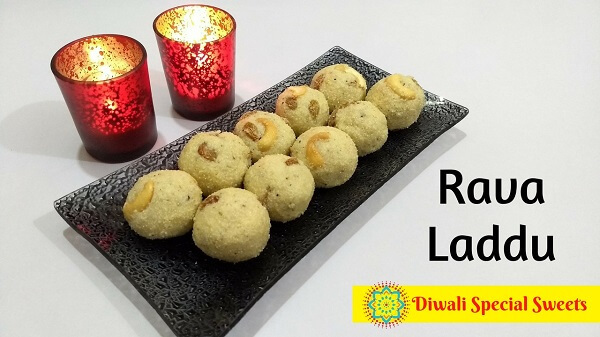 Enjoy Rava Laddu this Diwali and share your feedback and queries in comments below.